Heat oven to 450°F. Spray 13x9-inch pan with cooking spray. In pan, mix sausage, vegetables and soup. In medium bowl, stir Bisquick mix, cornmeal, milk, eggs and 1/2 cup of the cheese until blended. Pour over sausage mixture. Bake uncovered 25 to 30 minutes, sprinkling with remaining 1/2 cup cheese for last 1 to 2 minutes of baking, until light brown. 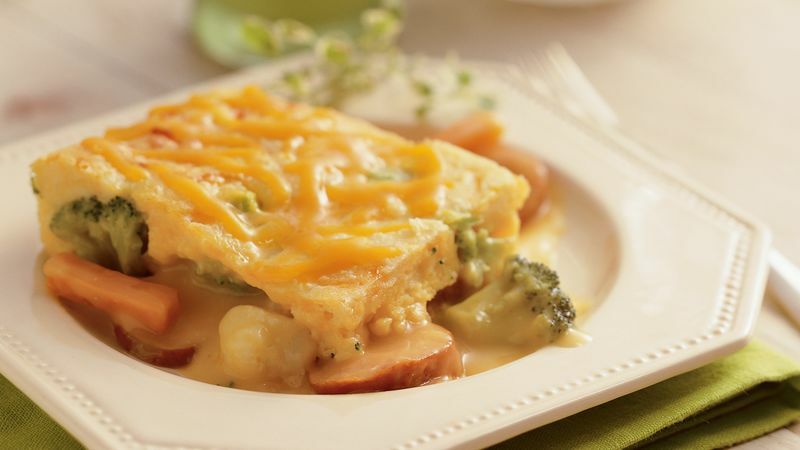 Use any 1-pound bag of frozen vegetables (thawed and drained) in this casserole. You can use condensed nacho cheese soup or a 16-ounce jar of double Cheddar cheese pasta sauce for the Cheddar cheese soup.